Navy leadership took the ever-present threat of fire seriously, and from the beginning wished to provide fire-fighting equipment for each of the frigates. As early as November 1794, Commissioner of the Revenue Tench Coxe began to pester Secretary of War James McHenry for fire engine specifications. It took two months before McHenry addressed the issue by requesting Naval Constructor Joshua Humphreys to transmit the ideal dimensions for the engines to Coxe. Mr. Thayer was Ephraim Thayer of Boston. A former apprentice of Paul Revere and an ardent Federalist, Thayer had started making fire engines as early as 1793. These first engines have been designated “hand tubs” by collectors because they were typically hand drawn and hand fed with buckets. The pumping handles make them look like the old railroad hand cars. By pumping the handles up and down, the operators drove the pistons to produce enough pressure to shoot water to astonishing heights. Surprisingly, a relatively large number of Thayer’s products still survive. The Boston Fire Museum owns what is purported to be his first engine, a 1793 hand tub designated West Boston No. 6. Henry Ford owned another, and the Old Plaza Fire House in Los Angeles has one. A Thayer hand tub was even sold at auction just last year. 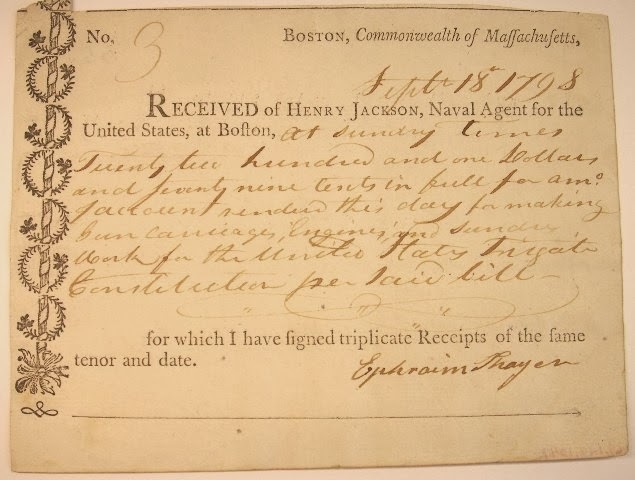 A receipt of payment to Ephraim Thayer from Navy Agent Henry Jackson. For making the ship’s gun carriages, fire engines, and “sundry work” Thayer received $2,201.29. USS Constitution Museum collection. Thayer’s engines performed well. The first recorded instance of their use comes from the April 4, 1799 entry in Constitution’s log: “In chace the air light and variable Tackd as necessary to work to windward employd wetting the Sails with firemen and Engines.” Wetting the sails caused the hemp or flax fibers to swell. This reduced their porosity, and it was believed, improved their chances of catching light breezes.